July 9th, 2006: Summertime! And the living is easy - at least for those of us that don’t have to make hay, chase cows, or fix fences. Perfect summer weather - nice and hot, yet usually enough breeze to make it bearable, and cool at night. Last Saturday, on our way home from Chelan, we saw a young bull moose in the ditch. It was in lovely shape, black and sleek, with just stubs of antlers. We stopped and watched it for a while; it didn’t seem too alarmed, just started trotting along the ditch. We kept up with it for a bit, then it crossed the road in front of us. Standing still, they are one of God’s ugliest creatures; when trotting they are one of the loveliest! When we were at Nisse Foundry on our Artisan’s Tour, we bought a bronze sundial. Doreen always wanted a sundial, so now I expect my meals on time, even when she’s working in the yard. Although it is definitely low-tech, as near as I can tell it keeps pretty good time, but it fizzles out when the sun goes behind a cloud. 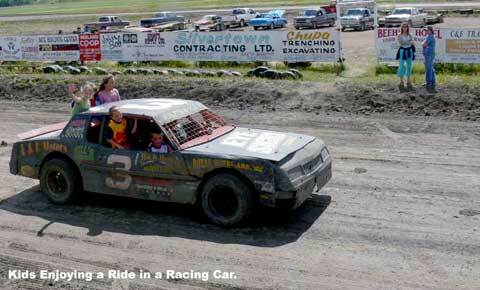 We went to the Stock Car Races in Tisdale today. I have a new camera and wanted to try it out on some fast action. 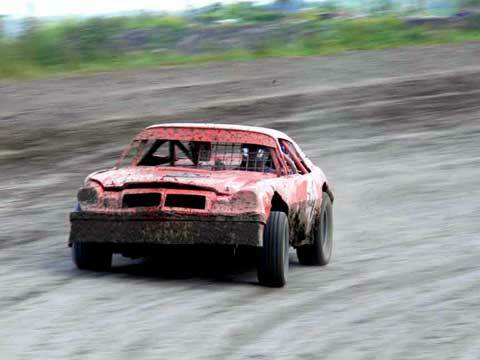 I missed the chuckwagon races last week, so thought stock car races would be fun. The camera performed well, but the photographer didn’t. I took almost a hundred pictures and found three suitable for this report. The rest I just dumped. That’s the beauty of digital - it doesn’t cost anything to take lots of pictures! I got a prize-winning photo of chuckwagon races one year, but so far haven’t made it to any this year. You could almost say we stayed home the past week; we were in Tisdale twice, Porcupine Plain twice, and Kelvington once. I guess that’s about the same as staying at home. We certainly feel at home in all three places. If you are driving north on Highway #38, be careful at the junction with #23 - the roadside grass is very tall and you can’t see traffic coming from the west until you are right out in the driving lane. We talked with Jerry Murrie and Sabrina Reed at the Cove today. They tell us swimming lessons are starting soon. Call 278-2992 for particulars. They are changing the Cove’s focus back to a family-oriented resort. 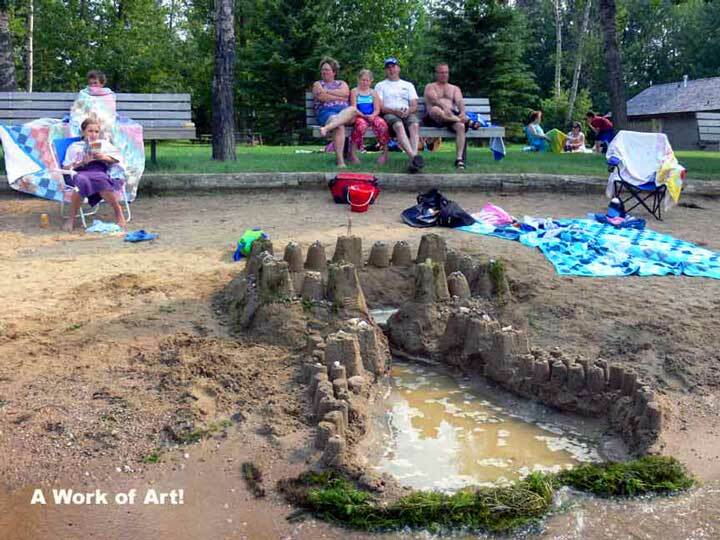 The swimming pool is the start of it; they are doing a major refit on the mini-golf, and there are a whole bunch of activities planned for the August long weekend. There will be a big Farmers’ Market/flea market/arts & crafts sale where people can rent space to sell whatever they like. There will be a Home of the Frisbee meal where kids get their meals in Frisbees, and keep the plates when finished. We had planned to be away that weekend, but are adjusting our plans to be back here. It appears the fireworks show planned for August 12th has been cancelled. There is a big sign on the wall of the Beach Café to that effect and they should know - they planned the whole thing. I don’t know if anyone else will pick it up or not. Sask Express will be in the Park on Tuesday, July 11th, and Connie at the Beach Café tells me she is putting on a smorg that day. 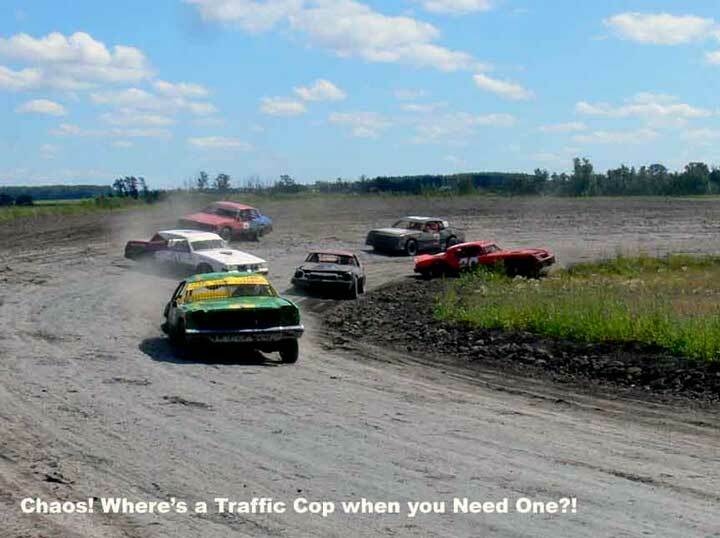 Sask Express - always popular! Some coming events - I am putting on a slide show at the Park Hall next Friday, the 14th, with an assortment of historical and current Park photos, and maybe even a few wildflowers. I understand the Park Activities staff are serving coffee and goodies afterwards. It won’t be a long show, not much over a half hour (unless someone twists my arm real hard to show more!). It starts at 7 PM. And Sunday is the pancake breakfast at Marean Lake Resort, from 9:30 to 11:30, a fund-raiser for cystic fibrosis. Be there - it will be a good event! One of our coffee row friends recently had a short stay in hospital. Another regular went to see him and was appalled because he seemed to be turning blue. Then he realised he had his chair leg on the oxygen tube! I went for a walk down on the beach last Monday afternoon. It was wall-to-wall people, but somebody found room to build a pretty major sand castle. Lots of activity at the Canteen too, with people lined up for ice cream. 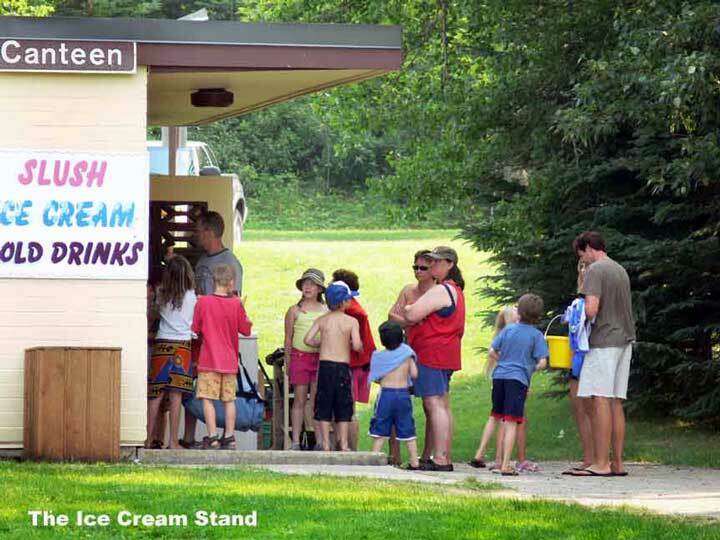 Of course, it was about 30° and ice cream would taste mighty good!